Ask leaders of companies big and small about the goals for their businesses, and increased productivity will inevitably be in the mix. And it is no wonder businesses are so focused on productivity. Employees worldwide work an average of 45 hours per week, according to a survey from Microsoft, but they report that 17 of those hours are unproductive. Clearly, even incremental improvements can significantly impact business success. Beyond that, enhanced productivity can drive a happier and healthier work culture; 93 percent of workers cite productivity as key to achieving personal happiness. Unfortunately, recent trends are sapping productivity. First, increasingly sedentary, screen-focused jobs mean many employees spend their working hours sitting relatively still. Many companies, including Apple, are investing in standing desks so employees can alternate positions throughout the day. Tim Cook once called sitting the new cancer, and being able to sit and stand throughout the day can help lower one's potential health risk of obesity and heart disease. In addition to being healthier, consciously spending more time standing or regularly moving around boosts productivity. Another trend negatively impacting productivity is open workspaces. Here, the major issue is a lack of personal space. A recent survey of 700 high-performing employees across a variety of industries found that 54 percent of workers find their offices too distracting. In fact, according to another study by office design company Unispace, more than two hours of face-to-face time with co-workers might actually be too much collaboration. As a result, employees are turning to noise-canceling headphones and work-from-home options to get work done. Many companies are now doing more to promote wellness in the workplace. Along with being good for employees, it is also good for business. In the U.S., employee health-related problems cost companies more than $225 billion in lost productivity annually, according to the Centers for Disease Control and Prevention. Wellness programs, designed to positively impact both physical and mental health, improve employee attendance, attitude, and performance. In 2017, researchers from the University of California Riverside, UCLA Anderson, and Washington University also provided a direct link between wellness programs and increased productivity. By comparing productivity data and medical records, researchers found that wellness program participants had increased their productivity by the equivalent of one extra workday per month. High-performing companies are taking the health and productivity connection seriously – more than 75 percent track employee health as part of the company's overall risk management strategy. To engage employees and drive results, executives tasked with maximizing productivity are turning to technology in three essential ways. As of 2016, millennials are the largest generation in the workforce. When it comes to work, this group is all about flexibility. In a global survey of employees, millennials ranked flexibility higher than any of their other generational counterparts, with 69 percent citing intransigence as a leading reason to leave a job. So it is no surprise that millennials are happier and more productive when they can collaborate with co-workers from wherever they are – working from home, traveling for business or working in the office. Adept with tech in their personal lives, they have high expectations for technology to help them work effectively and efficiently. Today, smart technology strategies create true collaboration for workers in and outside of office settings, with online conversation capabilities, virtual meeting rooms, and collaboration tools that enable multiple employees to interact in real time. Done well, technology brings remote employees together and makes flexibility productive. But it is not about having the trendiest tech – it is about evaluating and understanding the options to choose tools that align with specific business needs. Investing in the right technology (and staying on top of rapidly evolving solutions) can provide a distinct competitive advantage. The much-maligned cubicle came of age as companies sought to maximize their office space. Now, the cubicle is all but dead, giving way to the open concept spaces that are popular today. However, while open offices can be a problem in their own right, the real issue facing the modern office is a lack of activity among employees. With productivity as the goal, offices should first aim to encourage movement. In an eight-hour day, it's recommended that employees sit for only about two hours. The combination of sit-stand desks and easily portable laptops, tablets, and phones makes it easy to stand up and move. Even small changes can result in major productivity boosts. A 2016 study of call center employees found that those with stand-capable workspaces were 46 percent more productive than their peers with traditional desks. By equipping employees with technology that enables them to work where they need to, companies empower employees to become more productive. When they're not tied to their desks, employees can choose solitude when they need to focus or common areas when they want to collaborate on the fly with peers. Editor's note: Looking for office cubicles for your business? Fill out the below questionnaire to be connected with vendors that can help. When selecting the right equipment for your office, put extra emphasis on ergonomics. Improper keyboard or mouse configuration can be detrimental to employee health and productivity, causing fatigue, pain, and even injury. Plus, employees often put undue stress on their necks while working on their laptops. Similarly, phones can be ergonomically problematic, as people tend to kink their necks in order to multitask while talking on the phone. Today's tech offers a range of ergonomic, adjustable devices that can be tailored to fit each employee. Baseline considerations include monitor, keyboard, and mouse placement; hands-free headsets; and task lighting. Sometimes, different devices are required for different users. For example, employees who need to refer to complex printed documents might benefit from a document reader. Or employees might benefit from the use of multiple monitors, which can cut down on switching back and forth between documents on one screen. Research conducted by the University of Utah demonstrated that having multiple monitors helped employees complete their work more quickly with fewer errors, and employees also reported that the work was easier to do. To get the most ROI in ergonomics, incorporate employee training. This way, employees have the information to fully optimize the tools available to them. No matter where they are working, they will understand how to position monitors at eye level so they don't have to turn their head to view the display. Or they will learn to recognize the symptoms of eye fatigue and how to combat it. The link between health and productivity is driving today's technological innovations. Tech solutions are creative and viable, enabling employees to work smarter. Companies that invest strategically in technology are able to drive productivity and establish a happier, healthier workplace culture at the same time. Websites are the best way to build your business in our digital-focused world. It is safe to assume that if your website has high traffic, your business is getting publicity and potential customers. If you're like most businesses, however, you're likely struggling to drive the volume of traffic you need to grow your business. Little to no website traffic is a common challenge among community members on Business.com. Many complain that their efforts to boost traffic take too long and aren't yielding the results they hoped for. What can you do to make sure your website is getting the greatest amount of traffic possible? Here are 10 strategies for businesses of all sizes to follow if they want to boost the number of visitors to their website. Editor's note: Need help with your website design? Fill out the below questionnaire to have our vendor partners contact you with information for free. In order for your site to have traffic, you need to let everyone know it is there in the first place! Invest in paid search ads, display ads, etc. so that customers can find you. As you likely already know, social media can be a huge benefit to any business. Include your website address in your social posts will drive your traffic through the roof. LinkedIn, in particular, presents an enormous opportunity for generating web traffic. If you constantly post blogs, videos, etc. that others in your field will find interesting, users are likely to read a post and then explore your company’s website to see what other interesting pieces of information you can offer. Today's consumers respond best to visual content. Adding a video to your site will bring in traffic and keep users engaged. Videos can range from tips of the trade to a simple “Welcome!” from your company’s CEO. Let your imagination flow and post short videos that will instantly draw in a reader. Try setting up a YouTube channel for your business. Post videos that are specific to your business and/or product(s), and don’t forget to include a link to your website in the video’s description. From real estate agencies to preschool teachers, people everywhere are using email marketing to get the word out about happenings in their line of work. If you send emails to past, current and potential customers once a week, chances are something will catch their eyes and give them that nudge to click on your email, which then takes them to your website. Just like that, your email marketing campaign is bringing in more website traffic. Search engine optimization (SEO) makes sure your website has keywords that will bring it to the top of a search engine’s results list when someone searches for your product(s) or business. When your website is at the top of that results list, you will increase your traffic exponentially. Blogging can be a powerful way to guide online traffic to your website. Publish fresh ideas and perspectives on a hot topic that pertains to your business. With your blogs, you'll need to craft a clear, attention-grabbing headline. Without one, people aren’t going to know what your blog post is about or even whether they want to take the time to read it, so they will most likely skip over it. One of the best ways to obtain higher website traffic is to become a part of the community (physically and virtually). You can drive more traffic from those in your physical community by purchasing billboard ad space that clearly displays your website address. Or, you can simply leave business cards at the local coffee house for their customers to pick up as they pay for their lattes. Your virtual community can range from social media to chat rooms about your specific line of work. Get advice from and give advice to others in your type of business and grow as a community that helps each other. Then, when it feels appropriate, offer your website address for others in the virtual community to visit. Another golden engagement opportunity lies in responding to comments on your blog. When readers feel their opinion matters and are encouraged to voice those opinions, they feel welcome to return and comment on future blogs. Bonus tip: When several readers bring up the same question/topic in response to your blog, create a follow-up response/blog that addresses this question in detail. Making sure your website is responsive and fast to load is a big factor in its success. Research has shown that if your website takes more than five seconds to load, the user will close out your site and move on. So, make sure your website is up-to-date with all the latest and fastest “juice” available. Analyzing data may sound tedious, but it gives invaluable information. With quality website monitoring and analytics software, you can find out which parts of your site people are visiting the most, which parts are slowing you down, as well as visitor demographics. Demographics can help you determine what needs to be changed to appeal to a certain age group or location. With analytics, your site developers will be able to perform makeovers so that your site receives higher traffic. Submitting content (like blogs) to other sites, such as Reddit, can be beneficial if you post to a sub-Reddit thread that is specifically about your blog’s topic. Mix.com (previously known as StumbleUpon), AllTop and Triberr are a few other sites that encourage relevant blog posts. Driving more traffic is partly common-sense strategies and partly insider knowledge. Follow these tips and watch your site’s traffic soar! 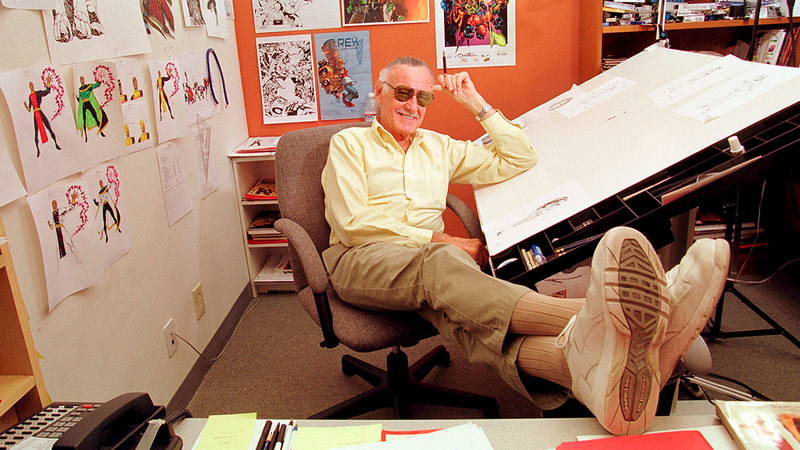 Stan Lee hated to see an idle artist. The renowned comic book writer and publisher, who died this week at 95, thought idle talent was bored talent, and bored talent was easy to lose to the competition. It also personally bothered him that the people in his employ might be scrambling to earn enough money. So Stan made sure to provide continuous employment, sometimes to the detriment of the company. In one famous anecdote, Stan doled out more assignments than the company needed—and didn’t bother to tell boss Martin Goodman about the extraneous inventory. He stuffed the extra comic books into a closet, intending to use them when the time was right. When Goodman saw the closet, he ordered Lee to fire everyone in the bullpen. Lee followed his boss’s orders. But he still felt it was a mistake—he needed to assign the extra stories, he argued, in order to invest in his people. I studied Lee for my book, Superbosses. As I explained in HBR, a superboss isn’t just a really good boss. They don’t just build an organization or surpass a revenue target; they identify, train, and build a new pipeline of talent. The way Jon Stewart’s Daily Show launched the careers new comedians, or Alice Waters launched the careers of new chefs. Through spotting, nurturing, and developing talent, superbosses — like comic book superheroes — have an outsized impact. Lee put his words into action years later when the Hulk, a Marvel franchise, became the subject of a popular primetime television show. He was amazed to see how the creative team transformed the Hulk for this new medium, and he was glad to stay out of their way. “I learned a helluva lot about TV from Ken Johnson during the many discussions we had about how to best adapt The Incredible Hulk to television. The success of that show, under Ken’s direction, proves beyond any doubt how important it is to put creative projects in the hands of truly creative people.” Lee enjoyed being fairly hands off as a boss, and extended that courtesy even to younger staffers, who more-traditional bosses might have said were too green. A third lesson I took from Lee’s example: give credit where it’s due. It sounds so straightforward, but in reality, it’s very rare. One way Lee gave credit was by creating a credits page, written in a chatty tone. The credits page was unique in comics; up until then the artists drawing and inking the panels had remained anonymous. The credits might read something like this: “Written with Passion by Stan Lee. Drawn with Pride by Jack Kirby. Inked with Perfection by Joe Sinnott. And lettered with a Scratchy Pen by Artie Simek.” He also talked about the staff frequently in his monthly newsletter The Bullpen Bulletin. These shout-outs occasionally changed or shaped the careers of the people in his department. For instance, in the middle of his career, artist Jack Kirby was nicknamed the “King of Comics” by Stan Lee, and Stan reported that he was the “artists’ artist.” To this day, Kirby is known as the King of Comics, or “King Kirby.” This kind of publicity was not only good for the artists, but made it possible for a young reader to become particularly devoted to their favorite artist. It branded certain artists as Marvel artists, enabled readers to feel another level of intimacy with the product, and allowed Lee to promote the careers and further the professionalization of the field, another passion of Lee’s. Finally, Stan Lee’s example is a reminder to dream big. There’s no better way to motivate the best people. “We’re trying to elevate the medium,” he once said. “We’re trying to make [comics] as respectable as possible.” Lee felt that comic books had the power to make important social commentary, to be incisive and satirical and smart. He believed that a day would come when an intelligent adult wouldn’t be embarrassed to be seen walking down the street with a comic strip, and he constantly pushed toward that goal. He suggested that comics should be studied at the college level, saying, “If people are going to study movies, TV, opera, ballet, concert, sculpture, painting, and other media, they might as well study comic books because comic books are just as profound and strong a factor in shaping, and moving, and molding people’s thoughts.” He argued there was no reason comics shouldn’t be seen as viable art. That attitude drew the best artists to want to work with him. Lee wasn’t perfect—no person is. Ultimately, he repositioned comics, professionalized the industry, and launched the careers of dozens of proteges. It’s a legacy any boss would call super. Caitlin Rosenthal, assistant professor of history at UC Berkeley, argues there are strong parallels between the accounting practices used by slaveholders and modern business practices. While we know slavery’s economic impact on the United States, Rosenthal says we need to look closer at the details — down to accounting ledgers – to truly understand what abolitionists and slaves were up against, and how those practices still influence business and management today. She’s the author of the book, Accounting for Slavery: Masters and Management.